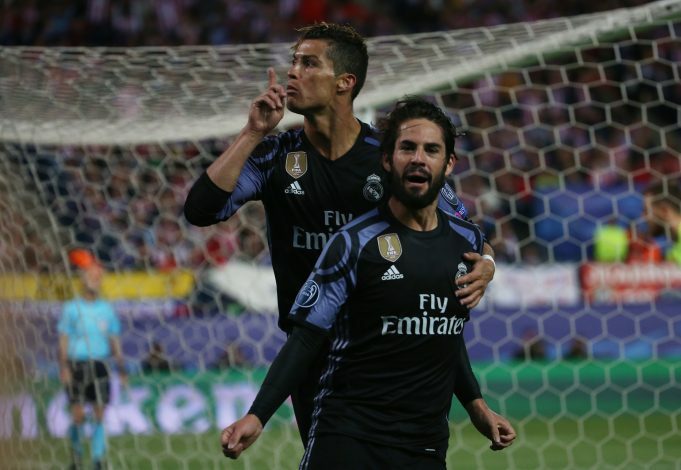 Defending champions Real Madrid held off a spirited Atletico Madrid to set up a meeting with Juventus in next month’s Champions League final in Cardiff. Atletico were trailing Real 3-0 from the first leg, but they showed their intent within the first twenty minutes. The Los Rojiblancos started the game at a frantic pace, with Koke forcing keeper Keylor Navas to save within the first 5 minutes. The midfielder then sent in a corner from the right in the 12th minute, which Saul Niguez headed in. Varane then clumsily bundled Fernando Torres over, and the referee decided it was worth a penalty. Antoine Griezmann stepped up to the spot. The Frenchman, who had missed a penalty in last season’s final against the same team, made no mistake and put the home team 2-0 up. The stage was set for an improbable comeback for Atleti, but a superb piece of skill from Karim Benzema helped Real grab a crucial away goal. Benzema dribbled past three defenders on the edge of the box, before passing to Toni Kroos, whose powerful striker was saved by Oblak. But Isco was the quickest to react, and he scored to give Real a 4-2 aggregate lead going into the break. Atletico, needing three more goals to qualify for the final, pushed harder after the break, with Yannick Carrasco and Kevin Gameiro coming close to scoring. But Real’s defense and midfield had settled, and they made sure the scoreline of the match remained 2-1. The Los Blancos had scored three in the first leg, ending the tie with a 4-2 aggregate. Real Madrid look on the way to become the first team to defend a Champions League title – they beat Atletico in last season’s final on penalties. Los Blancos will meet Juventus in the final at the Principality Stadium in Cardiff. The two clubs had previously met in the semi-finals of the 2015 Champions League campaign, wherein the Old Lady came out on top that time around. However, Real’s record in European finals is impeccable, and they will be favourites to win their second successive Champions League final come June. A Rahul Dravid, Liverpool, Rafael Nadal, and Badminton fan boy. Learnt most of life’s lessons on the field. Work also featured by SportsCafe, Essentially Sports and QuarkMe.